Opus One is a hugely exciting global proposition due to its First Growth like power, voluptuous mouth-feel and stunning purity; a true wine powerhouse. Younger vintages also represent an excellent investment opportunity as they are undervalued against their equivalent scoring older vintages. 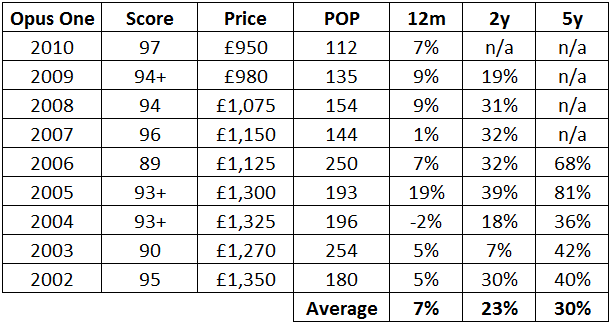 This can be seen from the Price Over Points Scores below, with older vintages reaching £1,300 a six bottle case after five years in bottle. Moreover the average POP score across the vintages since 2002 is 180 and the 2009 and 2010 vintages currently have POP scores of 135 and 112 respectively. This represents a vintage premium and therefore it benefits buyers to secure the wines early in their life-cycles. It is also instructive to look at Opus One’s price increases over the last few years. Taking a basket of vintages back to 2002, Opus One has increased 7% in value over the last 12 months, 23% over the last 24 months and 30% over the last five years. This suggests an accelerated increase in the average price of Opus One. Opus One distributes its wine in Europe through Bordeaux negociants, releasing on the 1st of September every year. As such the Place de Bordeaux experiences large demand and perennially sells out of their allocations in only a few weeks. Outside of the US, Japan is the biggest market for Opus One and this is quickly spreading into China. Production is similar to Lafite and Mouton Rothschild at 25,000 cases a year. Despite the large domestic consumption in the US, Opus One is found on every good wine list, the wine’s popularity is growing in Europe and Asia year on year, leaving a shortfall in supply despite its ample annual production. The genesis of Mondavi’s Opus One was a joint venture between two wine giants and leaders in innovation, Robert Mondavi and Baron Philippe de Rothschild. The first vintage was the 1979, released in 1985 under the name Napamedoc, a wine stylistically created to represent a single Bordeaux style, based on Napa Valley Cabernet Sauvignon. The winery is located in Oakville, one of the most central wine regions in the Napa Valley. The valley straddles the Mayacamas and Vaca Mountain ranges, which create cool yet extremely sunny conditions, perfect for high quality grape growing. The winery boasts the best winemaking technology available and the wine is aged for 18 months in new French oak barrique and then for an additional 18 months in bottle before it is released to the market. The assemblage is 95% Cabernet Sauvignon and 5% Merlot. The limestone winery and the world beating wine have become a symbol and the apogee of great American winemaking. We tasted the 2009 and 2010 vintages in Bordeaux this year and they are both stunning. The 2009 is fleshy, ripe and extremely aromatic with delightful ripe tannin. The 2010 is simply stunning, it is structured, retaining a wonderful freshness and elegance. The 2010 has quickly taking on the mantle of their greatest ever vintage, while the 2009 is close behind yet already very rare in the market. Taken together the 2009 and 2010 represent an excellent investment opportunity and should not be missed.